It will be hard to bet against #24 Columbia for both the team and individual title. Not only because Heps XC is on their home course, but Columbia has our favorite for the individual title, Nell Crosby, as well as strong team full of distance talent. Crosby – a 2016 NCAA steeplechase qualifier – has been the top Ivy runner in every single race she’s contested this season so far by comfortable margins (9 seconds over Cornell’s Jackie Katzman at the Columbia XC at VCP; 25 seconds over Yale’s Andrea Masterson at the Nuttycombe Wisconsin Invitational two weeks ago). A pair of Erins – Erin Gregoire and Erin Melly – have been reliable #2 and #3 runners for the team while Sarah Hardie has successfully stepped up from her usual mid-distance events to help in team scoring. Rookie Serena Tripodi and Julia Sienski have also led the team at the Paddy Doyle Meet of Champions and Paul Short Brown races, helping Columbia to the team title at Paul Short. Columbia has yet to race against #30 Dartmouth or Princeton A squads this season. Both Dartmouth and Princeton could be the dark horses for the team title. Like Columbia, the Dartmouth women have been the top Ivy team in each competition they’ve had so far this season, posting top 4 team finishes at the Battle in Beantown 5km (4th) and PSU National Open (3rd) behind other nationally ranked squads. This has helped them get their current #30 ranking. 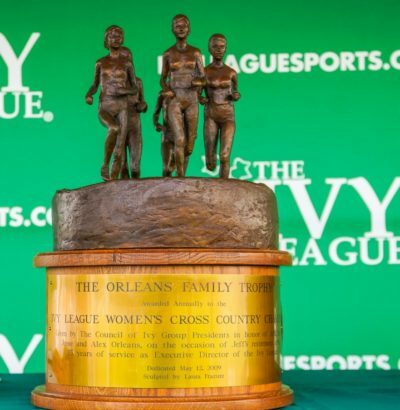 The Big Green women do not have an individual title contender; however, they have a tight running pack. Led by Olivia Lantz, their running pack has been between 30 and 40 seconds all season long and has been a fast enough group to edge out other conference competition who have faster #1 runners, like Princeton and Cornell. Ella Ketchum is one of the faster freshmen in the conference this season. Princeton won the women’s title back in 2015 when HepsXC was last contested at VCP. Megan Curham wasn’t on the squad back then as she was taking the year off for an internship, but she’s back now. We were not able to find any previous results for Curham on this course, but we still expect for her to challenge Crosby for the individual title as Curham is a previous HepsXC champion and All-American in cross country and the 10km. Now, can the rest of the Lady Tiger pack keep up with Curham? Princeton has a fast freshman group that finished 5th with a 17 second spread in the Paul Short Gold race (top Ivy team), led by Sophie Cantine. Brighie Leach and Melinda Renuart were a part of the 2015 HepsXC championship team, with Leach being the #4 runner that day. Yale started their season with a national ranking and a strong showing at the Panorama Farms Invitational (2nd), but a subpar showing at the Nuttycombe Wisconsin Invitational (20th overall, but beaten by a number of unranked teams) dropped them from receiving any national votes. If Yale can regroup, they could contend for the top 3. It will be a challenge though, as Columbia, Dartmouth, and Princeton have improved as the season progressed. Andrea Masterson is Yale’s #1 runner this year. She’s previously run 21:11 on this course last year at the NCAA Regional meet, while also being Yale’s #6 runner back at 2015 Heps XC. Cornell has been competitive against their Ivy competition so far this season, but they didn’t have quite enough to best them yet. The Big Red have strong athletes in Jackie Katzman, Erin McLaughlin, and freshman Gabrielle Orie, who have led the team at various points throughout the season. If they want to nab a top 4 spot, they will need to get their scoring spread down. It is possible though – Taylor Knibb is adjusting back to cross country racing after a delayed start from her defending her world title back in September. Knibb has been Cornell’s #4/#5 runner these last two years. Brown, Penn, and Harvard will be looking at new faces to lead their teams at HepsXC this year. Carleen Jeffers and Megan Ratcliffe have been leading the Bears throughout this season. Jeffers was the top freshman at Heps XC back in 2015. We are not expecting Natalie Schudrowitz to compete as she has not competed since February 2017. For Penn, we expect Abby Hong to get her first Ivy honors at HepsXC as she has risen to Penn’s #1 runner and improved her course-best times throughout the season. Meanwhile, freshmen Danielle Orie could be challenging her twin sister Gabrielle for top rookie honors this year as they continue to race side-by-side whenever both Penn (Danielle) and Cornell (Gabrielle) are competing in the same race (aside: I don’t want to be their parents and have to debate which team to cheer for at Heps…). The defending champions Harvard has lost their star power to transfers during the off-season and only two of their scoring athletes (Elianna Shwayder and Erin Dietz) from their 2016 squad have raced this season. We do not see them cracking the top four, let alone defend their title this year as they have been soundly beaten by all Ivy competition they’ve raced against so far this season. Abbe Goldstein has been a bright note for the Crimson this season as she’s adapted well to collegiate racing and was the Crimson’s #1 runner at the Battle in Beantown and Nuttycombe Wisconsin Invitational. Your thoughts of how Friday will pan out? Vote in the women’s team championship poll below. We’ll share the results later this week.